A Year of Being Here: Anna Akhmatova: "Everything is Plundered, Betrayed, Sold"
Anna Akhmatova: "Everything is Plundered, Betrayed, Sold"
"Everything is Plundered, Betrayed, Sold," by Anna Akhmatova, from Poems of Akhmatova, edited and translated by Stanley Kunitz with Max Hayward. © Little, Brown & Company, 1973. 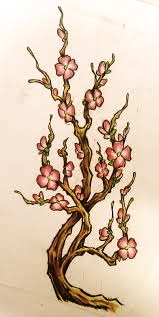 Image credit: "Cherry Blossoms," colored pencil, by Collin Kasyan. One way to interpret it: Life is full of suffering. But it is also full of wonder. How we experience it depends on what we pay most attention to. Check out this album and article. I'm an Iris fan and now more people will know about Anna Ahkmatova.